Special Order Item from mfg. if available. A better way to point and click. 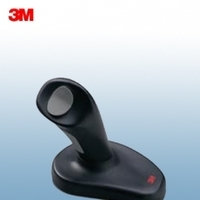 The 3M� Ergonomic Mouse is an ergonomically designed optical mouse that helps reduce stress to the nerve in the carpal tunnel and to the muscles in the user's arm. Helps reduce muscle strain while keeping arms and shoulders in a more relaxed, neutral position. Unique, ergonomic vertical grip design is unlike the traditional palm-down posture of most input devices. This "handshake" design allows the use of larger muscles to move mouse and has been clinically proven to reduce the muscle strain and discomfort associated with carpal tunnel syndrome and repetitive stress injury. Users can choose the size of the mouse most appropriate for their hand and can work easily and comfortably for hours. Left and right click functions using the thumb button on the top of the vertical grip. 3rd button on handle can enable scrolling in some applications. Easy installation, USB connector with PS/2 adapter. Compatible with PC, Macintosh, and iMac computers with USB ports. Two-year warranty and a 30-day money-back guarantee are included. For right-hand use. Macintosh:Works with the new G4 Apple Power Macintosh Computer with USB port. Plug and play only. No software support.